1. Pw is the tire price in the U.S. before the tariff and Pw+t is the higher tire price after the tariff. 2. As a direct result of the tariff protection for inefficient domestic producers, their output expands from Q1 to Q3, and imported tires decrease from Q2 to Q4. 3. As a result of higher tire prices and fewer tires purchased, American consumers as a group will be worse off by the area (-a, -b, -c, and -d), which represents the loss of “consumer surplus” from the tire tariff. 4. American tire manufacturers will be better off by an amount represented by the area +a, because they have both increased sales (to Q3) and raised prices (to Pw+t) as a result of their protection from more efficient Chinese tire producers. 5. The U.S. government will collect tariff (tax) revenue on imported Chinese tires by an amount represented by the area c, which is the product of tire imports (Q4-Q3) times the tariff (t). 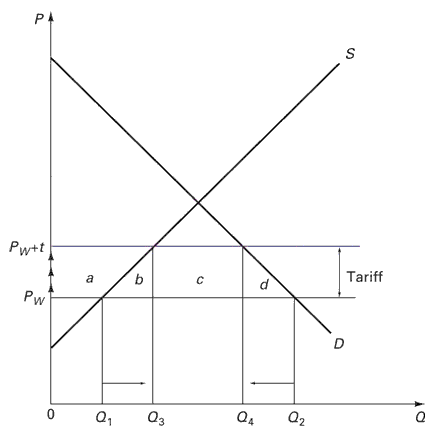 If we can assume that the tariff revenue in area c will be redistributed efficiently to the economy, we can treat that as a net gain to the economy (this could obviously be argued). Benefits of Tire Tariffs: U.S. producers are better off by area +a, and the government is better off by area +c. Net Loss: The costs of the tire tariff (-a + -b + -c + -d) are greater than the benefits of the tire tariff (+a + +c), for a net welfare loss of (-b + -d), which will be the “deadweight loss” of the tire tariff (costs to the economy that are NOT offset by benefits). Bottom Line: America will be worse off with the tire tariff, not better, and we will suffer from higher tire prices, a net loss of jobs, lower economic growth, and a reduction in our country’s standard of living. That is why economists almost universally support free trade and oppose tariffs and trade protection – economic analysis and empirical evidence clearly show that there are always net welfare losses from tariffs. Therefore, it will be Americans in the end who will be punished with the punitive tire tariffs. Is the Chinese Economy the Atlas of Global Growth?